But is it any good? To be honest I don’t know as I haven’t used it in anger for an extended period yet. But here’s the details, some photos, an unboxing video and an endurance test for ya. As always, there’s more photos in the Flickr Set for this post. 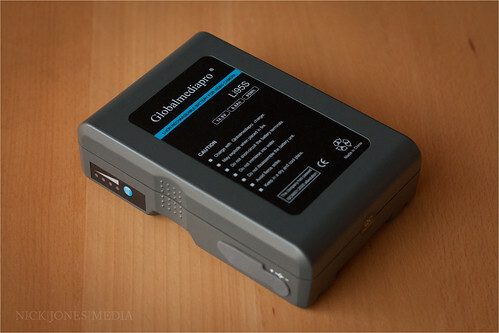 This is a GlobalMediaPro Li95S V-Lock battery. It’s pretty standard as far as V-Locks go. 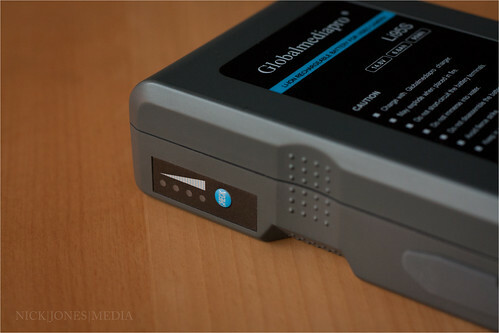 It also has a D-TAP output and a power input for charging using the charger that comes with the kit. It also has one of those nice LED indicators to tell you if its full and empty. As this is the ‘try out kit’ it came with a charger, namely the SC1 Charger. 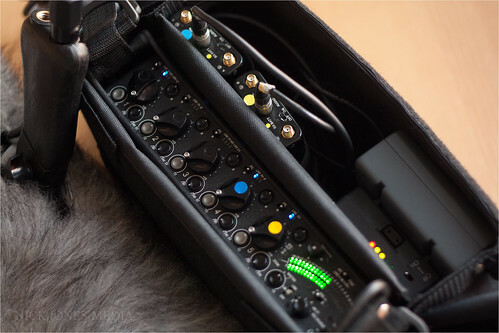 This is particularly useful for me as I don’t really need load of batteries to power my soundkit and therefore don’t need a (costly) multi-charger either. 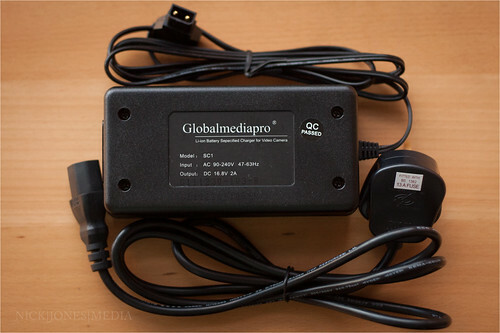 It’s a pretty standard charging block, comes with a UK plug and ends in a D-TAP plug. 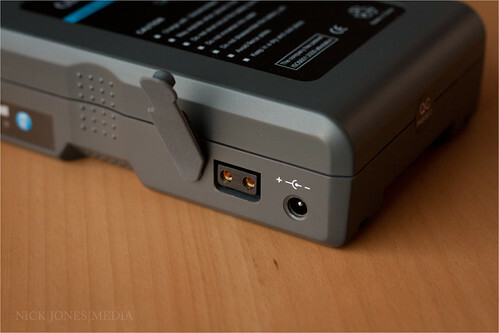 It also comes with the adapter that turns it into the right plug for the power-input for charging the battery. As it arrived almost completely flat I thought I’d test how long it took to charge to full. Using the charger provided it took about 4 hours, which isn’t too bad! I then threw it in my soundkit to see how long it would last. 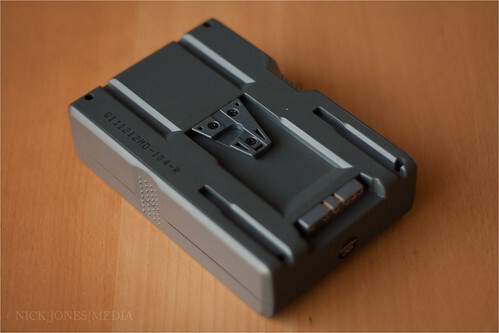 The battery sits on a HawkWoods V-Lock plate that distributes power through Hirose to a SoundDevices 552 mixer (with a mic using P48) and two Micron 100 RXs. I then sat back and watched TV while the LED’s bounced happily away. Much to my surprise it lasted just over 27 hours! I don’t intend to be working for 27 hours straight but I’m pleased to see it’ll do a couple of standard days without the need for a charge. 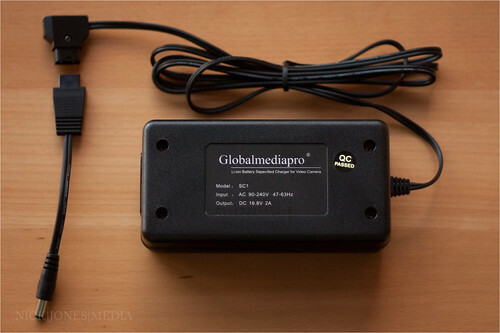 I think GlobalMediaPro are based in New Zealand, or possibly Australia. Either way it flew in with DHL so packaging is important. I made a (slightly rambling) unboxing video for you to see exactly what you get when you buy one of these batteries. Enjoy!